for three weeks, he is very timid, has had 21 teeth removed which gives his vocal Aaaarooo! an unusual roll he has never been on a lead and doesn't understand carpet. but he is coming around and loves his new mate, as with most Schnauzers they get on famous. 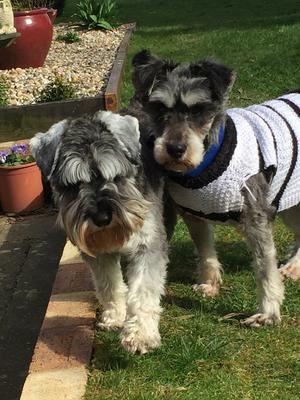 We love the photo of your two handsome Schnauzers! They look like they are great pals and full of life. Thanks for sharing and good luck with the pair of them.